co-host of the popular PBS television series, History Detectives. in Hardcover, Softcover, and eBook (Kindle & Nook) formats. or by ordering through the service desk of fine bookstores everywhere. English language versions also available in Canada, France, Germany, Italy, and Spain. or the 3-volume series, I recommend that you wait until the update is completed. which is available online or at the service desk of your favorite bookstore. 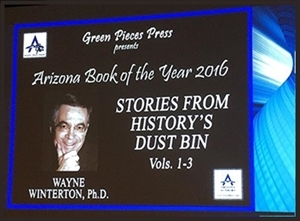 On November 5, 2016, in a ballroom at the beautiful Embassy Suites Biltmore Hotel in Phoenix, Arizona, the Arizona Authors' Association in partnership with Green Pieces Press Publishing hosted a Gala Event. The purpose of the event was to (1) raise money to promote and advance Arizona youth and adult literacy throughout the state, and (2) to announce, celebrate, and award the finalists and winners of the Arizona Literary Awards competition for 2016. Money for Youth and Adult Literacy was raised through an outstanding Silent Auction of items ranging from Weekend Retreats and limited edition Paintings to Restaurant Fare and Gift Cards. The competition recognized five unpublished and three published categories (Children's Literature, Fiction, and Nonfiction). Submissions were accepted world-wide as long as the manuscripts and published works are printed in English. 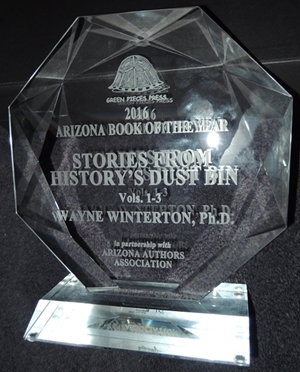 Winterton's 3-volume set, Stories from History's Dust Bin, competing against a field of 81 entries, was awarded First Place in the Nonfiction category and eligible for consideration for Arizona Book of the Year, the culminating event of the evening. Also eligible for Book of the Year was Lisa Y. Potocar of upstate New York for her book, Train to Glory (Children's Literature); and Sharman Apt Russell of Silver City, New Mexico for her book, Knocking on Heaven's Door (Fiction). When the lights were dimmed, the envelope opened, and the winner announced, Stories from History's Dust Bin stood alone. In the Introduction to the Dust Bin books, Dr. Eduardo Pagán, co-host of the PBS TV series, History Detectives, writes, "...what sets the telling of these stories apart from the presentation you will often find in history textbooks is Winterton's writing style. He occasionally engages the reader with a thoughtful or rhetorical question in mid-story, or inserts a nuanced thought to encourage the reader to imagine beyond the obvious." The International Literary Award contest, established in 1980 by the Arizona Authors' Association, accepts English language submissions from authors anywhere in the world, and winners are selected by a respected panel that includes international judges. await your reading pleasure inside each volume of History's Dust Bin. Stories range from 500 to 1,200 words, average reading time per story, five to nine minutes. any time where one to a dozen short historical vignettes would help to pass the time. I really enjoyed all three volumes of the "Stories from History's Dust Bin." I can only imagine the process you set for yourself in gathering tidbits, then sifting through for the best ones, and compiling them by relationship to dates on the calendar. 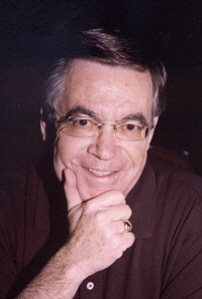 Larry Pointer, author of In Search of Butch Cassidy, University of Oklahoma Press, 1977. I just finished reading History's Dust Bin Vol. 1. It was an extraordinary read, a fascinating journey into parts of our world we don't know. [The author] has uncovered, apparently through relentless research, an interesting story for every day of the year, items that are educational, funny, shocking, and always entertaining . . . delivered in small pill-sized doses. John W. Sloat, Presbyterian Minister (retired), Zelienople, Pennsylvania. 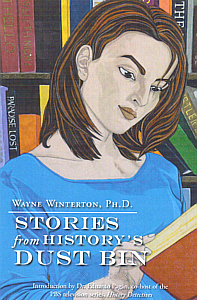 What Wayne Winterton has given us is both an educator's research of history coupled with a good guy's chuckling look at unforgettable people, all encapsulated in very readable short stories. - Slim Randles, Albuquerque, New Mexico, syndicated columnist, author of Sun Dog Days and Raven's Prey, and recipient of the 2012 Rounders Award. This vast collection of stories about well-known and long-forgotten personalities is as informative as it is interesting. It is a must read, a wealth of unique information about people and events that is intellectually challenging, highly entertaining, and sprinkled appropriately with personal humor. - Dr. Armand A. Lakner, Potomac, Maryland, Apollo 11 Mission, Systems Reliability Manager, NASA (Retired), and author of From Mauthausen to the Moon. How can I begin to tell you how awesome these books are! The stories are short, but so informative. I’ve read and reread some of the stories, enjoying them even more the second time around. Mary Musselman, Secretary (retired) to U.S. Congressman James V. Hansen (UT), North Ogden, Utah. Just when you thought you knew a little bit about people, this book makes it clear that you don't. There is a story for each day of the year and it was my intention to read one every day, but I ended up reading several each day. I recommend ... a Kindle version for anyone who hates to pick up a magazine in a waiting room. Myschyph, Amazon website comment. Very interesting reading. Love the stories. They make me realize our larger society is made up of many fascinating people. Their ideas, ingenuity and drive have all added to the fabric of a fascinating family of man. I am also impressed with the amount of work that went into the writing and creating. Well done! Bryan Watkins, Partner, LRA Real Estate Group, Phoenix, Arizona. Interesting stories about people you thought you knew but you learn more about, and people you have never heard of. Organized to read in a one-a-day format, but like potato chips, one is never enough. Richard Atwood, Amazon website comment. I just want you to know how much I am enjoying your book. It is funny and informative and I enjoy the sayings at the end of each story. Thank you for putting the time and effort into this endeavor. It is my morning routine along with breakfast. I am looking forward to ordering the other two volumes. Kaye Halladay, Office Manager (retired) Property Management Company in Provo, Utah. L to R: Patricia Yuen, Linda Glass, Sondra Edgar, Tina Garcia, and Marci Gill. signing as author / radio personality Slim Randles looks on. * Winterton began his teaching career in Utah in 1963, moving to New Mexico and becoming the principal of two schools on the Navajo Reservation (Lake Valley and Dzilth-na-o-dith-hle). He has also served as the Superintendent of the Albuquerque Indian High School, Superintendent of Schools for the Northern Pueblos Agency, and during 1978-79 was the interim President of the Institute of American Indian Arts, a junior college in Santa Fe. From 1979 to 1986 he worked for the federal Office of Surface Mining in Kansas City, Missouri, and Tulsa, Oklahoma. In 1986, he joined the staff of the Bureau of Land Management's National Training Center in Phoenix, Arizona as the Division Chief for Administrative and Media Services and briefly as Center Director. He retired in 2004 with over forty years of public service. He received his PhD from the University of New Mexico in 1976. Thank you for visiting the Stories from History's Dust Bin website. You can also visit the Whistler's Gold website by clicking here: Whistler's Gold. Whistler's Gold is a romance-mystery novel by the same author, set on the Navajo Reservation in New Mexico.